A service member's ex-spouse might be entitled to his military retirement benefits. 2. Can I Get Half of the Retirement if I'm Still Married to My Military Spouse? In 1981, the Supreme Court ruled that military retired pay could not be regarded as joint property and divided during a divorce. Following that ruling, Congress passed the Uniformed Services Former Spouses Protection Act, or USFSPA, which allows state courts to divide military retirement pay in a divorce, similar to a private pension. The law also makes it easier for an ex-spouse to collect child support and alimony payments from a retired service member. Some ex-spouses might be eligible for health care benefits, depending on how long the service member served and how long the marriage lasted. When a spouse divorces a service member, the USFSPA gives the state divorce court the authority to treat the service member's military retirement pay, minus qualified deductions, as joint property. Just as the court might divide a private pension benefit, it can divide military retirement pay as part of a court-ordered property settlement or as part of a final divorce decree, dissolution, annulment or legal separation. 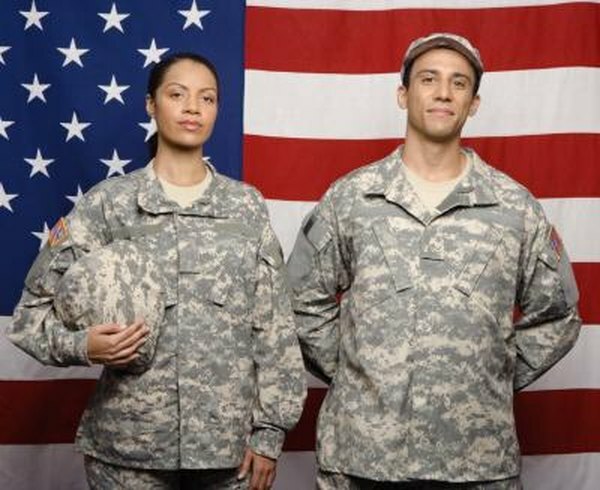 The law also allows the court to directly garnish the wages of a service member who owes child support or alimony. The most an ex-spouse can receive is 50 percent of the service member's retirement pay. If the former spouse of a military service member is awarded a share of the ex-spouse's military retirement pay, the service member served for at least 10 years, and the former spouse was married to the service member for at least 10 years that overlapped the service member's military service, the ex-spouse can receive direct payments from the military for the portion of pay to which she is entitled. Otherwise, the former spouse must obtain her part of the military retired pay from the former spouse. The military can pay garnishments for child support or alimony directly without meeting the 10/10 requirement. If a service member fails to pay child support, the ex-spouse can submit an income withholding order to collect current and previous unpaid child support for up to two years in the past. The former spouse can also use the order to collect current alimony payments, but cannot use it to collect alimony payments in arrears. In addition to collecting up to 50 percent of a retired service member's pay as allowed by the USFSPA, an ex-spouse can obtain 15 percent of retirement pay through an income withholding order, for a maximum of 65 percent of the service member's military retirement income. Upon retirement, service members are automatically enrolled in the Survivor Benefit Plan program, which provides an annuity to a spouse or named beneficiary when the retired service member dies. If the service member divorces after he retires, the ex-spouse is removed as the automatic beneficiary of the plan. A former spouse may still be the named beneficiary of the annuity, but must file a request to be renamed the beneficiary as a former spouse within one year of the final divorce decree. If a retired service member served in the military for at least 20 years, a former spouse was married to the service member for at least 20 years, and the 20 years of marriage overlapped the military service by at least 20 years, the former spouse is entitled to full commissary, exchange and health care benefits. If the period of marriage overlapped by only 15 years, the ex-spouse is entitled to health care benefits for one year following the final divorce decree.